Shetland Sheepdog Characteristics: The picturesque, fun-loving and sweet-tempered Shetland Sheepdog is a breed of medium sized dog, classified as a member of the Herding Dog Group (AKC:1911). The Shetland Sheepdog, is characterized by its graceful, captivating appearance with a profuse coat and mane and a sweet, friendly expression. Other characteristics include dark brown, medium sized, almond-shape eyes; small, high set ears; a low, thick set, tapering tail and an agile, almost floating, gait. The temperament of the Shetland Sheepdog can be described as Playful, Affectionate, Responsive. The coat type of the Shetland Sheepdog is described as long, rough coat in assorted colors. Due to its characteristics and qualities, the Shetland Sheepdog demonstrated the desired traits of a Farm Dog and is known by its nick name the "Sheltie". The origin of the Shetland Sheepdog breed was in United Kingdom (Scotland) where it was developed in the late 1700's. Number 6 in the Smartest Dog List. Shetland Sheepdog Breed Group and Dog Type - Herding Dog Group (AKC:1911): The Shetland Sheepdog is one of the many breeds of dogs that belong to the Herding Dog Group (AKC:1911). Other names for the Shetland Sheepdog: The Shetland Sheepdog is known by the nickname of the "Sheltie". 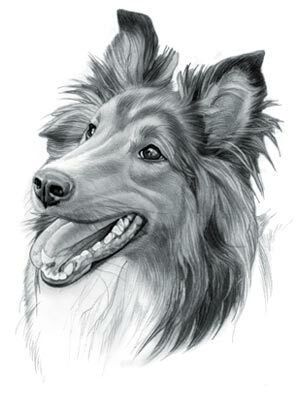 Other names for this breed of dog include the Sheltie, Shetland Collie, the Lilliputian Collie and Toonie dog. Origin of the name: The origin of the name "Shetland Sheepdog" derives from the place it first originated in the Shetland Islands, off the northern coast of mainland Scotland. Shetland Sheepdog History and Origin - the Miniature Collie: The country of origin of the Shetland Sheepdog breed was in United Kingdom (Scotland) during the late 1700's. From time immemorial a sheepdog, of one type or another, has presided over the welfare of flocks of sheep in every land. The Shetland Sheepdog were developed to suit the rugged, chilly, rocky environment of the Shetland Isles in Scotland. The ancestors of the Shetland Sheepdog can be traced back to the spitz-type of dogs of the Vikings, who used their dogs to herd reindeer. The Shetland Sheepdog was used in the 1700's as a sheep herding dog and the Border Collie is also believed to be an ancestor of the breed. Prices of wool soared at this time and the English introduced sheep farming in order to capitalize on the profitable wool market and also to eradicate the lifestyle and culture of the Highlanders following the Jacobite rising of 1745. The ancestors of the Shetland Sheepdog breed became indispensable and 1792 was called the 'Year of the Sheep' because so many sheep were put onto land in the Scottish Isles and Highlands. Shetland Sheepdog History: The Shetland Sheepdog was used as an all round farm dog working for the Crofters who inhabited the Shetland Isles. A crofter was the person who occupied and worked in the small landholdings that were known as crofts. Crofters usually only had less than 30 sheep and a small sized herding dog suited their needs. The Shetland Sheepdog is just a miniature sized Collie aka the Lassie Dog. The gorgeous, miniature dog attracted a lot of attention by visitors to the Shetlands in the late 1890's, when it was becoming fashionable for ladies to have miniature, fluffy, pet dogs. An islander called James Loggie of the Lerwick Kennels (Lerwick was the main port of the Shetland Islands) realized that the appealing little dogs would prove to be a profitable source of income for a few of the Islanders. James Loggie established a breeding program to standardize the new breed. In 1908 James Loggie founded the Shetland Collie Club in Lerwick and in the same year the Shetland Sheepdog was exported to the United States where it was an immediate success. The Shetland Sheepdog was officially recognized by the American Kennel Club (AKC) in 1911. Shetland Sheepdog Modern History: The modern history of the Shetland Sheepdog (the miniature Collie) moved on and the affectionate, energetic is now a popular family pet and loyal companion. The Shetland Sheepdog is easy to train so it is no surprise that the Shetland Sheepdog ranks as Number 6 in the Smartest Dog List, nor is it any surprise that one of its ancestors, the Border Collie, is ranked as the Smartest Dog in the World. Shetland Sheepdog - The Little Mermaid (1989 movie): The 1989 Disney Movie 'The Little Mermaid' features a Shetland Sheepdog called "Max". The American voice actor Frank Welker supplied the voice of Max. The Little Mermaid is one of the most popular kid's movies of all time and the cartoon character "Max" has become the most famous Shetland Sheepdog in the world. Shetland Sheepdog Height: The Shetland Sheepdog breed is classified as a medium sized dog. The height to the shoulder of a male dog is 13-16 inches (33-41 cm). The height to the shoulder of a female dog is 13-16 inches (33-41 cm). Shetland Sheepdog Weight: The weight of the male in this medium sized dog is 14-27 pounds (6-12 kg). The weight of the smaller female dog is 14-27 pounds (6-12 kg). Shetland Sheepdog Coat Type: The coat type is described as a long, rough coat. Shetland Sheepdog Coat Colors: The colors of this dog breed consist of assorted colors consisting of Sable & White, Merle, Tri-color, Sable, Black & Tan, Black & White and Blue Merle. Merle a finely mottled, blended, flecked, or combination of any two colors, especially white. Sable is a dark brown color..
Shetland Sheepdog Grooming - MODERATE Grooming Needs: The dog grooming needs of the Shetland Sheepdog is not extensive and therefore categorized as Moderate in order to maintain a healthy coat, reducing the risk of skin infections. The modest grooming needs of the Shetland Sheepdog is considered to be mid-maintenance requiring weekly brushing and combing. Dog Grooming Requirements should include bathing the dog on a monthly basis and making regular inspections of the teeth, eyes, nails and ears. Shetland Sheepdog Litter Size: The litter size of this dog breed ranges from 4-6 puppies. Shetland Sheepdog puppies for sale can be obtained reputable breeders and from rescue centers. The cost of Shetland Sheepdog puppies varies depending on location, pedigree history and the dog breeder. Shetland Sheepdog Temperament and personality: The temperament and personality of the popular Shetland Sheepdog dog breed is described as Fun-loving, Playful, Affectionate, Responsive and Sweet-tempered. Shetland Sheepdog Exercise Requirements: The exercise requirements of this breed of dog are moderate. The Shetland Sheepdog requires regular daily exercise consisting of about one hour every day. This medium sized dog has an agile, almost floating gait with strides of a moderate length requiring a steady walking or jogging speed by the owner to meet the dogs exercise requirements. If the dog has more energy than you do, then teach your dog to play ball in a chase and catch game. Shetland Sheepdog Diet: A fully grown Shetland Sheepdog should be fed twice a day. A diet consisting of a premium dog food can be balanced with fresh food eaten by the family. The question is What Can Dogs Eat?. Check out our comprehensive list of what dogs can and what dogs cannot eat. Shetland Sheepdog Health Problems: Potential health problems of the Shetland Sheepdog breed include Eye Problems . Resolving health problems can prove to be expensive and it is always wise to obtain pet insurance or dog health insurance when buying a dog. Is the Shetland Sheepdog breed said to be Hypoallergenic? Answer: No. Shetland Sheepdog Lifespan: The life expectancy of dogs vary according to the size, breed of dog and any serious health problems. The typical lifespan of the Shetland Sheepdog breed is 12-14 years. Shetland Sheepdog Male Dog Names: Male Dog names are most often chosen to reflect favorite names of the owner or the strength, size, coloring and country of origin of the Shetland Sheepdog breed. To give you some inspiration regarding good male Shetland Sheepdog names our small selection might be of help with naming boy dogs. Our top male Shetland Sheepdog dog names are: Shep *** Irvin *** Mitch *** Monroe *** Tavish *** Torrey *** Bram *** Craig *** Gaven *** Fraser. Shetland Sheepdog Female Dog Names: Female Dog names tend to be softer, prettier and reflect the temperament of the Shetland Sheepdog girl dog. Our top choice of good female Shetland Sheepdog names are Arial *** Carys *** Gwendi *** Mercia *** Jen *** Jinelle *** Olwen *** Nerys *** Gwen *** Seren *** Tegan.